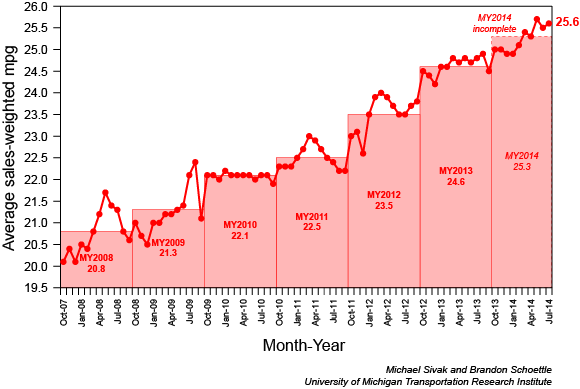 As we reported early last June, new vehicle fuel economy (window-sticker value) in the U.S. hit an all-time high in May of 25.7 miles per gallon (MPG) as reported by the University of Michigan Transportation Research Institute. June saw a slight dip in fuel economy, off 0.2 to 25.5 MPG. The institute just released their research for July, showing a modest rebound from June of 0.1 MPG with an average fuel economy of 25.6 MPG, just 0.1 MPG of the record high set in May. Overall, new vehicle fuel efficiency is up 5.5 MPG since October of 2007, when the Institute first started monitoring and collecting data. 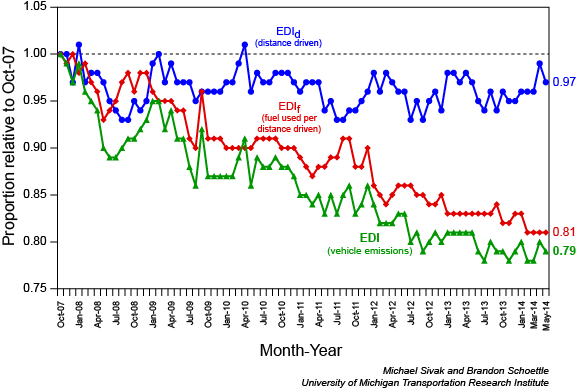 The University of Michigan Eco-Driving Index (EDI) estimates average monthly greenhouse gas emissions from an individual U.S. driver. The lower the index value the better. The EDI consists of fuel economy data and miles driven, the later of which is published with a two-month lag time. The latest EDI for May indicates the average new car driver in the United States produced 21 percent fewer greenhouse gas emissions in May of 2014 than in October of 2007. As you begin to understand the significance of the system being offered to the trucking industry, you will also begin to understand how it can affect the economics of the United States and has potential to affect world economics once introduced. System I want to introduce is titled the Reaction Arm System (RAS). Solution I have to offer will deliver a minimum of 80% improvement in fuel economy which will provide a savings of $46,154 ($57,692 x 80% = 46,154) for every 100,000 miles of highway operation for each class 8 tractor and trailer. This calculation is based on a 6.5 mpg average and a cost of $3.75 per gallon. For a class 8 tractor this level of fuel economy improvement has never been possible until discovery of a new concept. After you review data I am prepared to send it will become very clear that the initial 80% reference is below the actual savings the system can provide. System I want to introduce is patent protected that provides wide protection for the technology and also confirms the design of the system is functional and is not a frivolous system. There is no simple way to state the impact of the system except to say it will improve fuel economy beyond any known level in our history except for full electric conversion. An 80% savings is being offered as a minimum because the basic design of the system is based on an 87.5% capability for the basic design. Additional options will increase the baseline savings. As indicated earlier, having a patent makes a basic statement; it confirms the design of the system is not a frivolous design. It is my hope that you, or your engineers, will have an interest in getting involved with developing a truly useful and functional fuel economy technology that also significantly reduces pollution. This technology has the potential to become the standard for all vehicles used for towing equipment or trailers in the transportation industry. Introduction of this technology is planned for the class-8 heavy-duty trucking industry while at the same time the system is adaptable to ‘any weight-class’ of tow vehicle including locomotive applications. After your review of the data, I am confident you will agree that a true solution for fuel economy is finally available that turns out to be a very simple and inexpensive solution. I am looking forward to your reply to allow an ongoing exchange.